Downtown St. Louis can be reached via car from all directions. None is particularly a nice drive, although I do like entering from Illinois via the Eads Bridge. 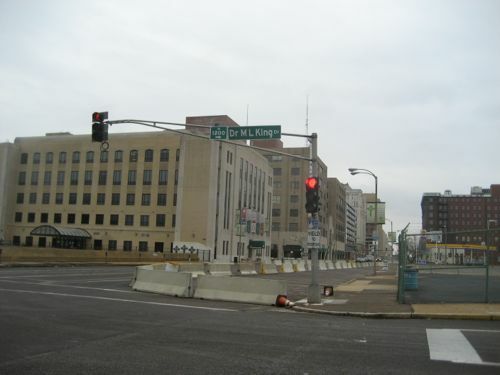 When the New Mississippi River Bridgeopens in 2014 motorists on I-70 from Illinois and west of St. Louis will have a new option, an exit that takes them to Cass Ave and directly onto a new alignment of Tucker Blvd into downtown. A short stretch of the rebuilt Tucker recently opened to traffic. I’ve had a chance to drive it twice and walk part of the sidewalk. It’s too early to do a review of the design of the road & sidewalks but so far it looks good with only a few problems I’ll note in a later post once more is opened. The good is the road is only two lanes in each direction. Rather than have three per direction with the outside used for parking or buses, the third lane isn’t a through lane. Space is provided for buses and parking but the road doesn’t feel excessively wide the way say Jefferson does between Olive & Natural Bridge. New new road, median, planted areas at the edges and street trees will make a great first impression. 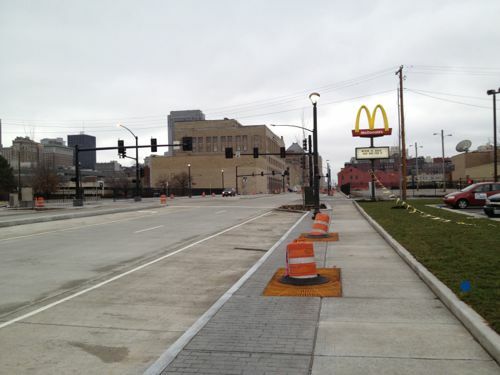 But when motorists look past the new sidewalks they will likely be disappointed by what they see. Great buildings like the one above, instead of housing retail storefronts, has the city’s Mosquito & Rat control division, aka Vector Control. Welcome to St. Louis! Regardless of your views on Paul McKee’s project you have to give him credit for recognizing the opportunity to develop new housing, offices and retail. ABOVE: The following message popped up when I went to save this image from the source: "Since we are still in the early design phases of the project, we ask that you please not copy our images yet since these designs are not final." For my purposes here it shows that planning is being done. I’m still concerned the new buildings will lack connections to adjacent sidewalks. St. Louis now has a “Complete Streets” policy, but no requirement for adjacent properties to connect. The ADA requires minimal connection but a building can be built and occupied without it, leaving enforcement up to those who complain. If we take McKee, and his consultants, at their word the area will be pedestrian-friendly. My preference, of course, would be a requirement by ordinance. Former 5th Ward Alderman April Ford-Griffin never would initiate such a requirement and I don’t expect any of the three woman running to fill the vacant seat to do so either. The election is December 20th. Good or bad, McKee has the Tucker & Cass area under control. But what about south of Biddle St? The 1986 McDonald’s was just razed and replaced. The new one does have an ADA access route from one of the four streets bordering the property, but it’s still a prototype Â best suited for a suburban/rural highway exit. 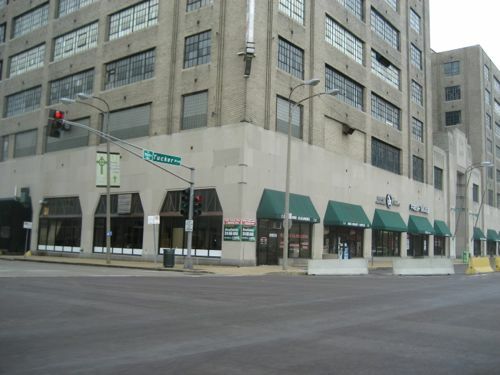 ABOVE: The east side of Tucker has the Post-dispatch, St. Patrick's Center & the Globe building, but the west side has parking and a gas station and little else. 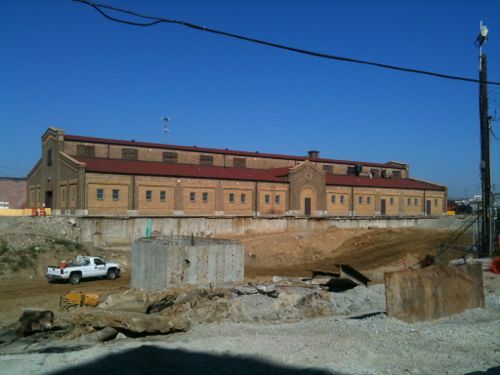 2009 photo. The west side of Tucker needs urban buildings up to the sidewalk, like they are on the east side. This is one of those opportunities that doesn’t come along often. Will we step up and take the necessary actions to ensure Tucker develops right over the next 20-30 years? This city has got to stop implementing development and policy for its lowest common denominator. Build for the future residents that are eager for the city’s success and will increase the tax base, not those that take advantage of it. I don’t see any reason why a series of three-to-five flats couldn’t be built here (with appropriate street-level commerce nearby, of course) and leased at the market rate.And as far as the downtown approach hitting Tucker…yes, please, to new curbside, urban-designed shops, offices and midrises. And no curb-cuts! I have two fears regarding residential along and near the new Bridge-Tucker connection. One, that it will be comprised of structures ill befitting a downtown core (i.e. vinyl-siding townhouses separated by grass side yards. Two, that the new residential will be positioned as low-income/section-8 space. We really need a master plan for the city. With increased desirability of the core, we will be dealing with more of these kind of planning issues. Main roads should not be allowed to have parking lots, gas stations or suburban construction. These should be tucked into side streets and behind multi level residential and retail. Enough planning. St. Louis needs to change it’s laws. Without that plans mean nothing, especially in a city that lacks planning culture. You are correct, planning is pointless when the zoning laws from 1947 are still in place. 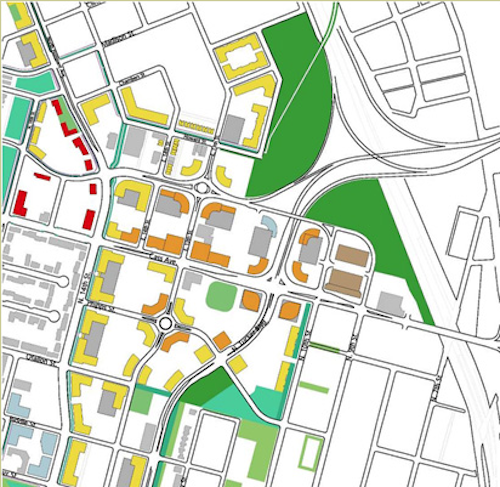 Whenever I advocate planning I also mean enacting a zoning overlay to give the plan teeth. I don’t imagine it would be that difficult to put together a very rudimentary citizen’s zoning statement, present it to downtown and downtown and surrounding ward constituents, gather support then present it to the aldermanic board and mayor’s office. The list of needs is long, but the list of needed standards is clear. No curb cuts on major roads, no exposed parking lots, new structures built up to sidewalk, etc. Have you ever worked with existing commercial property owners on something like this? The vast majority are very unwilling to “give up” any perceived “rights”. If something is proposed, or worse, unilaterally imposed, the issue of “takings” and compensation is immediately raised. Which is why I suggested starting from the constituents and working toward the top. It isn’t unilateral if you have the signatures to back it up. And as much as we cry afoul of our leaders being beholden to developers, there isn’t a one of them that would thumb their noses (at least openly, anyway) at an effort such as that. I think your site has been hacked. Coming from Google takes me to a virus site or something. Yes, someone is working on that. Have you ever worked with existing commercial property owners on something like this?Â The vast majority are very unwilling to “give up” any perceived “rights”.Â If something is proposed, or worse, unilaterally imposed, the issue of “takings” and compensation is immediately raised. 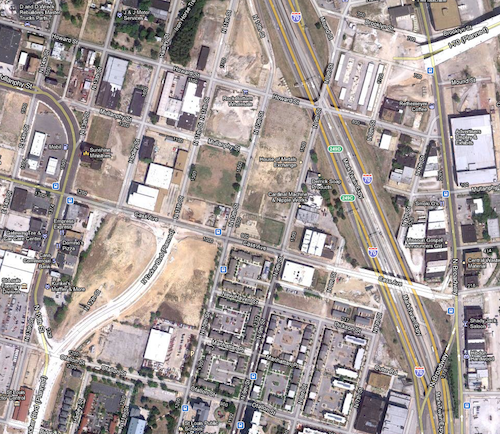 If I-70 downtown is removed, then the interchange between the future bridge approach, 70 and the extended Tucker need not be complex.Â Just extend Tucker further north to meet the new Memorial at-grade.Â The only directional ramps you would need are SB-to-EB and WB-to-NB, for actual I-70 traffic. If I-70 downtown is removed, then the interchange between the future bridge approach, 70 and the extended Tucker need not be complex. Just extend Tucker further north to meet the new Memorial at-grade. The only directional ramps you would need are SB-to-EB and WB-to-NB, for actual I-70 traffic. 10HLLBZBSGDX I like it very much!